Zach is a new(er) member to the Austin Simply Fit family, training with Darryl, and has quickly escalated in his fitness. “Zach comes in ready with an attitude to get work done everyday,” said Darryl. “He trains twice a week and isn’t a stranger to meeting his limit and consistently pushing it just a bit further at each and every session.” Zach’s progress has turned heads not only in his own social circles but also with the ASF trainers and family alike. Let’s go, Zach! I am a service manager for Cisco Systems. I decided to join ASF because the cost was competitive, it’s close to my home so I have minimal excuses, and I wanted to try out some guided physical fitness because I’d lost the motivation to do the solo gym thing. Initially my goals were largely superficial – lose weight, gain some show muscles, and look a little sexier for my partner, but the training has increased my interest in general fitness and strength training. I’m feeling good about my progress. I’ve made some good strides in terms of overall strength and endurance. My mental health and general energy level has increased substantially. I’m more confident in my daily life and enjoy the extra stamina during my work week. Balance is a big issue for me. 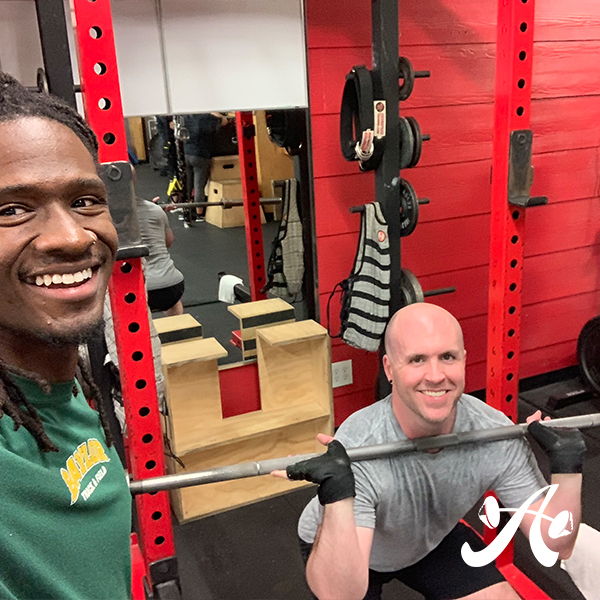 My center of gravity is a bit higher than I’d like, so Darryl has been helping me to build strength and confidence in that area to help me meet my broader goals and avoid injury. The results! I kind of had a tipping point in mind where results would need to justify the ongoing cost of personal training, but I have to say I get way more out of two 30 minute sessions per week than I think I would slugging away at the gym by myself, even with greater frequency. Why do you like working out with Darryl? I like working out with Darryl because he pushes me, keeps me challenged, but knows when to back off if I’m not there yet. What is it about Darryl/ASF that keeps you coming back? The noticeable results keep me coming back. It feels like the money and effort are well spent. I’d like to reach 300 pounds on my squat max in the near future. Also, I don’t want to get too heavy, but I’d like to pack on some more muscle before I trim down for next summer. Probably chicken and rice pilaf. Not exciting, but it’s a favorite. Set some realistic goals for yourself, but stay open to new challenges and listen to your trainer if they think you can do more. You’ll be surprised what you can achieve with the right guidance. Anything else you’d like to add about your experience at ASF or with Darryl? Darryl and ASF have been a pleasant surprise and a great experience. I wasn’t sure if it would be worth it when I started out, but I’m very happy with my results so far. I would recommend them to anyone struggling to meet their fitness goals.